This is a exciting new technology in our industry. For years, many suppliers have offered “Multiple Protocol” sensors where the protocols are baked into the sensor. Their advantage, is fewer sensors to inventory and faster protocol selection. Their disadvantage is when new or improved protocols are added, old parts are obsolete. Programmable’s offer a better solution, where new or improved protocols are updated in the tool and immediately available for use and a “TRUE” programmable, is a simple 2 sensor solution. Their only issue, is longer time to program sensors. 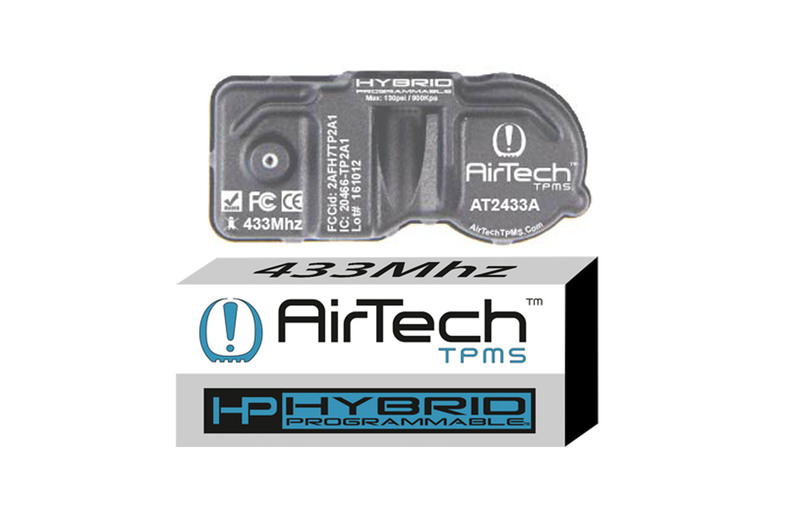 Our new “Hybrid Programmable” has multiple baked in protocols AND the tool can wirelessly transfer a new or improved protocols to the AirTech sensor. The end result, is a single tool activated protocol matched to your vehicle, just like the OE sensor. This is the foundation of our historical reliability. This sensor uses the newest IC technology. It is one of the rare sensors that uses a RF welded body, with air as the insulator and not heavy epoxy. Unlike others where on some vehicles must be programmed for use on left or right side... Our sensor, is just like the OE sensor, it sends the correct location signal no matter which side it is located on. AirTech offers a true 2 sensor solution, that’s all you have to stock, unlike 31inc Smart Sensor, ITM, or Dorman which have 5 sensors to inventory. AirTech lowers your inventory investment over 50%. Enjoy peace of mind with a sensor that has been used in over 3,000 tire stores. AirTech has over 90% USA coverage. It was just over a year ago that "Programmables" broke through. There was talk of Schrader's "Multi Frequency" as the next big thing. But they and others make you stock two expensive sensor sku's just because there is a inexpensive valve difference. And in the final analysis, even if it was a true ONE sensor solution, there is no great financial benefit of 1 vs 2 sku's to stock, compared to the old days when we only had 46 and then 16 sensor solutions with good coverage. What makes Hybrid Programmables the best solution is our ultra fast (3 Seconds) programming. That combined with the financial inventory savings and new profit from increased inventory turns, we offer a solid program in our attempt motivate you to consider switching to a new TPMS Solution. Valveless design saves store thousands a year in reduced inventory and increased turns. Sold as Single Unit. 12 Pcs to Inner Box.